When you need a place for some extra space for your large group or family, our 7 bedroom cabin in Gatlinburg has all the necessities for a nice and relaxing getaway in the Smoky Mountains. Let Large Cabin Rentals be your home base for your special event or gathering, and you’ll get these 4 benefits for staying in our 7 bedroom cabin, Heaven’s Corner. It’s nice to know that when you’re in the Smoky Mountains staying at our 7 bedroom cabin in Gatlinburg, you have the pleasure of sitting out on the deck and getting the majestic views of this great natural wonder. If you’ve had a long day full of activities and hoping everything goes great with an event that you’ve been planning, the visual that you get with a mountain view at Heaven’s Corner will certainly bring you feelings of relief and relaxation that you’ve been longing for. Staying in one of our large cabins should make you feel like you’re living in a fairy tale. Our 7 bedroom cabin in Gatlinburg was built with the uniqueness that a family deserves when they make a reservation for this beautiful structures. The architectural design of this cabin is top-notch in quality, and you can tell the builders were inspired by the location, working hard to create a picture-perfect memory of your temporary home in the Smoky Mountains. 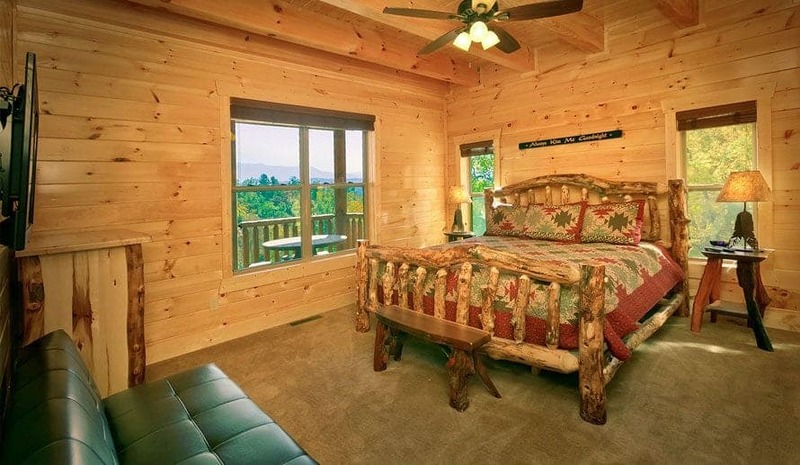 Our large 7 bedroom cabin in Gatlinburg isn’t just a sight to see on the outside; it is equally impressive by what it contains inside as well. Entertainment and relaxation are the first two things that come to mind when you do your first walk-through of your cabin. 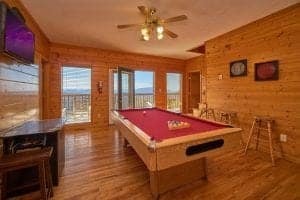 In this cabin, you can find a big screen TV, arcade games, a pool table — and also, a Jacuzzi, hot tub and rocking chairs in the relaxation department. Overall, it makes for an experience worth remembering, and that makes it all the more special for your large group. Now raise your hand if you’ve ever stayed in a cabin and feel like you’ve been treated like a number and not a person. At Large Cabin Rentals, that’s why we feel that having a vacation specialist just for you is important in ensuring your stay goes as smoothly as possible. If any problems were to arise, our vacation specialist will take care of your every need and give you some immediate help. Your happiness with the experience of staying in our 7 bedroom cabin in Gatlinburg is our top priority, so we do our best to make sure your stay is unforgettable. Those are just 4 benefits of staying in our wonderful 7 bedroom cabin in Gatlinburg. We hope your getaway is a memorable one, and we pride ourselves in providing you the means to have the greatest vacation that you deserve. If you’re ready to make Large Cabin Rentals the place to be, browse and book our 7 bedroom cabin for a magnificent stay in style!